Chinook Arch Victims Services officials were recently approved for their first-ever service dog from Dogs with Wings. After several weeks of training in Edmonton, Ringo has arrived in Mountain View County and has already been put to work. 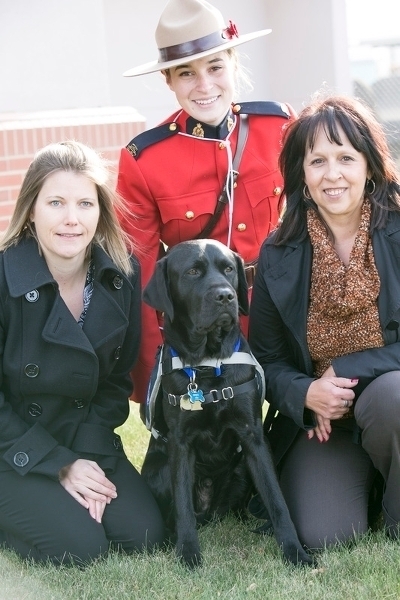 He is one of seven service dogs in Alberta for victim services purposes and is only the third RCMP-based dog in Alberta to assist with crisis calls. “This is something new for our unit and so we’re really excited,” said Rhonda Kearns, who is Ringo’s main handler and the program manager for Chinook Arch Victims Services. Ringo is a two-year-old black lab and is owned by Dogs with Wings. He will assist victim services officials with the three RCMP detachments they operate out of – Didsbury, Olds and Sundre. He will be assisting with crisis calls, police interviews with children, as well as providing support for children testifying in court. He will also be doing demonstrations at schools in Mountain View County as well as those in the urban centres within its boundaries. Kearns said she first decided to apply for a service dog after watching a demonstration by a service dog from Camrose at River Valley School in Sundre last year. “Three seconds into watching Lucy work her magic I was like we need a dog in our unit,” she said. She approached the board of directors with the idea, filled out an application and went to Edmonton for an interview with Dogs with Wings officials. After the application was approved, she and Tamara Plumb, who is also from Chinook Arch Victims Services and is Ringo’s second handler, went to Edmonton on Oct. 25 to undergo training with him. They returned to Mountain View County with Ringo on Oct. 30 and say he is fitting in well and has already been put to work. “He’s hit the ground running. From Day 1 we’ve been able to utilize him,” said Kearns, adding there are many benefits to having a service dog like Ringo. “In a stressful situation, if we can look at a dog and a dog is calm and it’s just kind of presenting like you’re safe, then without consciously thinking that you’re safe, you kind of know you’re safe,” she explained. Dogs with Wings officials will monitor Ringo and decide when he can retire. Kearns will have the choice to adopt him because she is the main handler of the dog. Didsbury RCMP Sgt. Kimberley Pasloske said she is excited to have a service dog assisting the detachment and said Lucy recently assisted a child while testifying in Didsbury court and it went over well. She said there are rules in the courtroom regarding a support person for a child and that person cannot touch or talk to the child because they could lead them in a certain direction. “But a dog can’t lead a child to say anything, so the child actually can pet the dog and actually have support. The dog can lie right on the child while he or she is providing testimony,” said Pasloske.